The time has come to cut into my stash of Echo by Lotta Jansdotter. 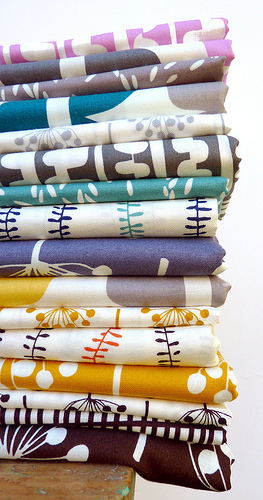 Echo by Lotta Jansdotter is such a pretty fabric collection that I was keen to feature the fabrics; accordingly the quilt design is super simple. I have used a neutral gingham fabric for sashing around each of the quilt blocks which helps to soften and blend the colors. The quilt top is now ready for basting, quilting, and binding. Busy days are ahead! What a BEAUTIFUL quilt! Sooo worth cutting into that gorgeous fabric for! LOVE IT! 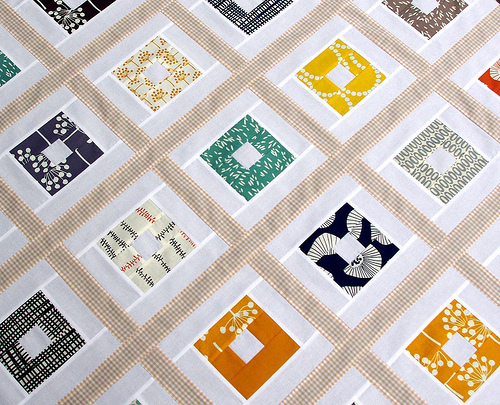 As always, you make such wonderful, simple, gorgeous quilts! Wonderful use of the beautiful Echo! Love the gingham as sashing, such a cute quilt. Just really pretty with that neutral sashing-excellent fabric choice. Looking forward to the final binding and Ta-Da moments. Love your quilts. Love how you did this quilt. It all works well together. Great job. Love the gingham with this line. My still sits smiling at me and daring me to cut it! I love it. What clever color choices. I absolutely love that quilt, I love the fabrics and I love the layout of the quilt! I can't wait to see it finished! I really REALLY like the checks you used in the sashing. Am on the verge of cutting into mine! This looks great and the gingham does the job brilliantly! Beautiful! I have yet to cut into my Echo stash as well, but I think I will also use a really simple design to really show this gorgeous fabric. I love how you paired it with the gingham. Isn't it weird how difficult it is to cut into our favorite fabric? ha ha! You quilt top is beautiful!!! it looks so neat and tidy with all the seams showing through from behind but just out of interest is there a reason why you iron all the seams to the white side and not the colour when the two meet? This is going to be a lovely quilt. the fabrics are so interesting and the sashing works really well. 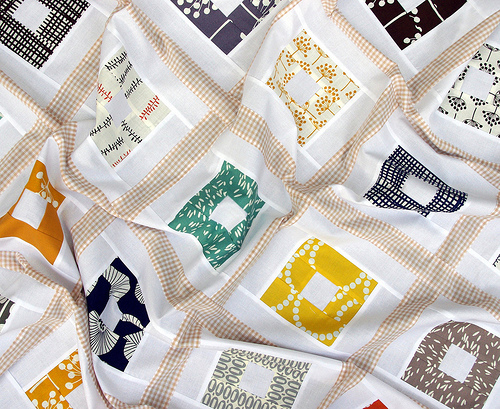 Pretty fabrics, pretty colours, pretty quilt. Ooh I love that Rita. Really interesting! Really really beautiful! Perfect sashing! Looks lovely! I haven't been brave enough to hack into mine. Ooo so pretty! Love this design with this line! I love it!! And the fabrics are yummy!! Striking. I've been wondering about this bunch of fabrics. Really do like them, thank you for the inspiration! That is so amazing. I love its simplicity in showcasing these fabrics. Absolutely gorgeous! The choice of the gingham is spot- (or rather square) on!! I love love love that line and you did a great job with that top. So simple, yet so effective. Can't wait to see it quilted and bound. Oh, gosh - I love, love, love this! I never would have thought of a neutral gingham. So lovely. Gingham hurts my eyes and looks too busy-- I would NEVER have chosen that as a sashing and I LOVE IT SO MUCH! Oh my goodness.... the things I think I would never like, right?! I'm in awe-- that is GORGEOUS!!!!!!! Beautiful quilt and I love the gingham. Awesome! I would never have thought of gingam! What a great idea. It is one fabric I love, but I am never sure how to use it. Wow - the use of gingham is genius! What a beautiful Echo quilt. I really love the fabrics and the use of gingham is awesome and shows them off so well. This is what I love about Modern Quilts as they look so clean. I just love these fabrics and have been doing a mad look around to try and find them since you posted this quilt top. I also love the pez you added in and there is a bright yellow and white ring you've added and I was wondering what fabric that was as well. What a great choice of sashing! Love the gingham. It really shows off the Echo in a new way. WOW! I just love what you decided to do with these fabrics! Sometimes I see a fabric collection that I love, but I'm not sure what to do with it because the fabric looks so beautiful already. Adorei o que você fez com tecido xadrez,ficou lindo.Tenho uns 12m de um amarelo e branco e não sabia como utilizá-lo,agora já sei.Obrigada pela ideia genial.Beijos. More RPQ gorgeousness. Thanks for sharing and inspiring. These look so pretty with the soft gingham sashing. Thanks for sharing!